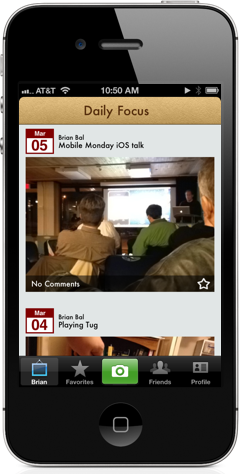 Daily Focus is a simple and fun photo journal for your iPhone and iPod touch. The "my photos" tab acts as your photo journal, letting you quickly view all of your photo entries and comments. Take great pictures, then enhance them with some of our great filters and frames. Mark your favorite photos as your favorites. This lets you keep a shorter list of all the best photos from you or your friends. Keep track of what your friends are up to and comment on their photos.